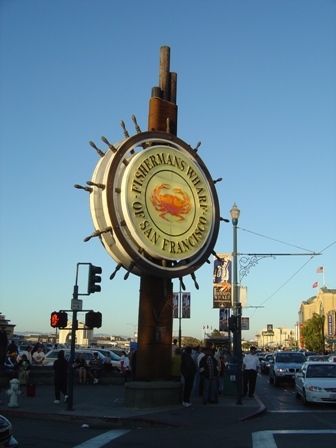 You could easily spend days exploring all that San Francisco has to offer. But on this trip, I didn’t have days. I only had about a half a day, and then I needed to drive on up the coast. So, I decided to take a very quick tour of some of my favorite spots in San Francisco. I’ll include them here, along with a few places I’ve visited on previous trips, but missed this time. This beautiful entryway into San Francisco is actually a pair of bridges, separated by a small island and a tunnel. The eastern section just recently opened, and is stunningly beautiful. It’s also the world’s widest bridge, carrying all traffic on just one level. The western span is a suspension bridge, similar to the Golden Gate Bridge, but longer and with more towers, and two decks. 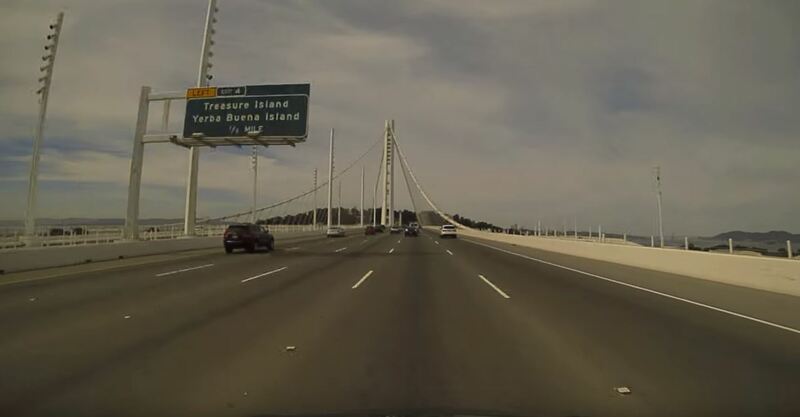 Fortunately, westbound traffic is on the upper deck, giving you a great view of San Francisco as you enter the city. The photo above is from the Drivelapse video. You can check out the entire video below. After crossing the bridge, I headed directly to Lombard Street. Of course, you already know about this attraction. This hillside was too steep for a conventional road, so the city built a street with multiple switchbacks. 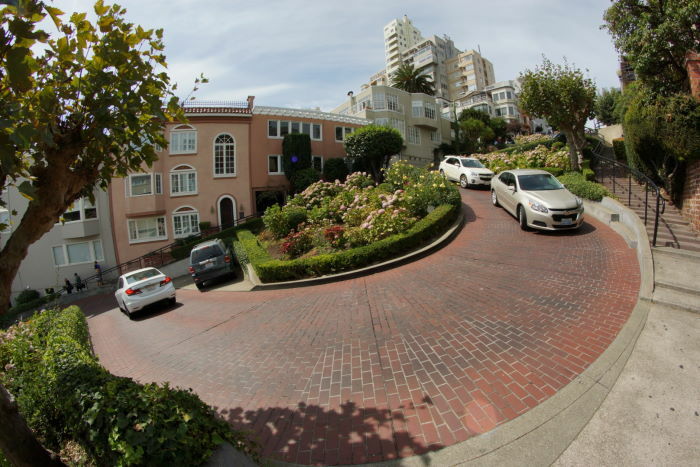 It’s one-way, downhill, and after you’ve driven down it, there are plenty of free on-street parking spots. Park your car and hike back uphill, for numerous great viewpoints. From the crooked section of Lombard Street, you’ll be able to look east, over towards the next hill, and spot Coit Tower. 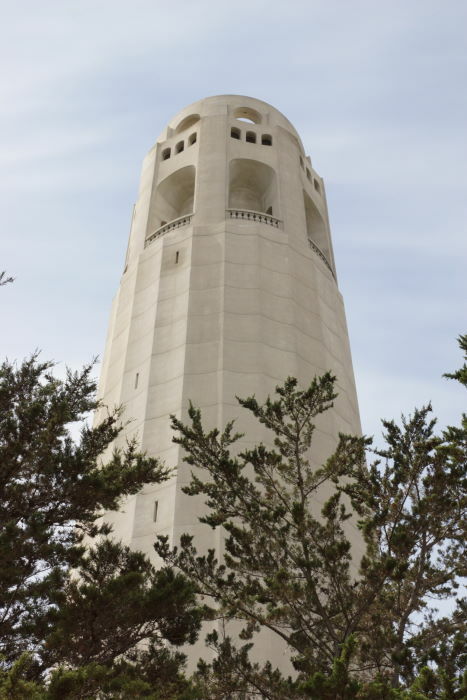 This art-deco structure sits atop Telegraph Hill, and yes, you can go up in it. You could consider Market Street to be San Francisco’s “Main Street”. 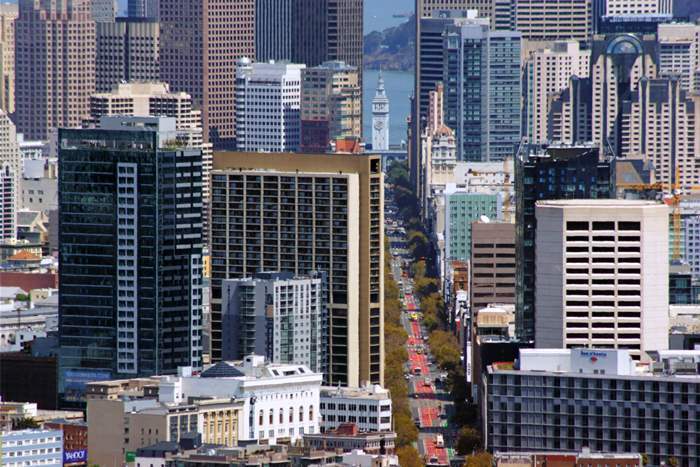 This diagonal thoroughfare slices the city into separate districts, as it runs from the Embarcadero towards Twin Peaks (which is where this photo was taken). Even though it looks like a big, wide street, it’s a painfully slow drive. San Francisco is just as unfriendly to cars as it is friendly to mass transit. You’ll notice all those red zones on the pavement. Buses and streetcars get to use them, while everyday drivers squeeze over to the side. 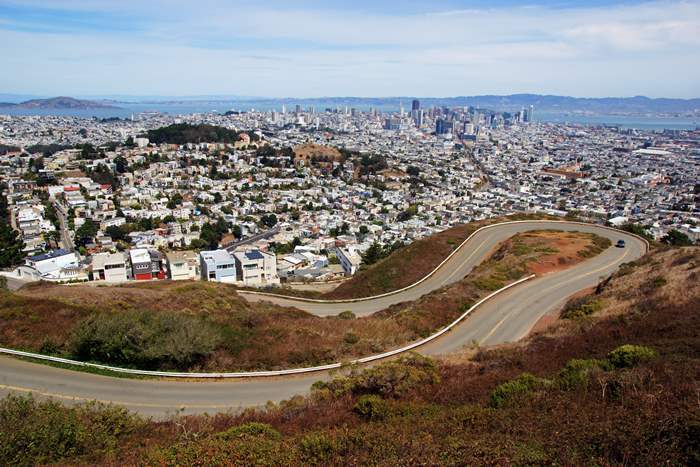 A GPS will help you get to the top of Twin Peaks. There’s a figure-8 road that loops around both peaks, and numerous parking spots and viewing areas. The views of the city are incredible up here, and you’ll probably see a lot of tour buses and foreign visitors. One more peculiar landmark dominates the view from Twin Peaks. 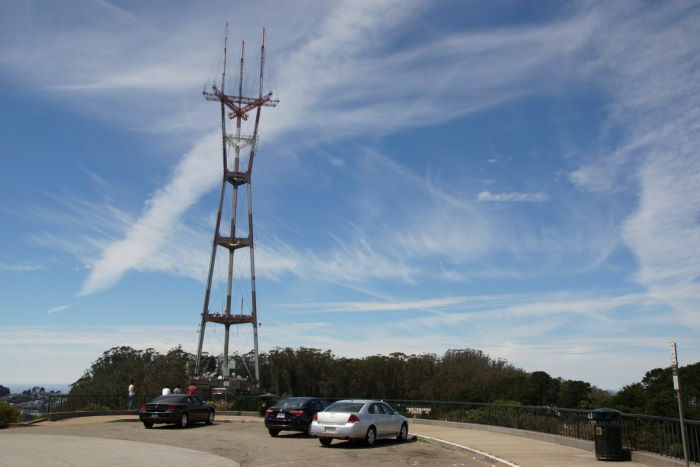 Up here, you’re in the shadow of Sutro Tower — an odd-looking, three-legged broadcasting structure that provides television and radio signals to the city. I, personally, think it’s beautiful, but a lot of people consider it ugly, and sometimes it gets edited out of photos of the city. There isn’t much I can say about this attraction that you don’t already know. 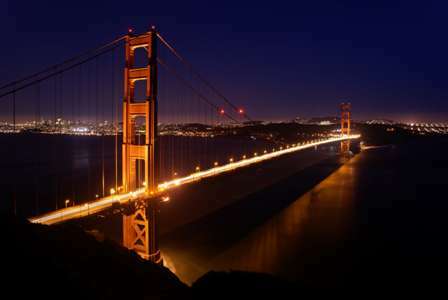 The Golden Gate Bridge is the symbol of San Francisco. There are parking areas on both ends, and you can walk or ride a bike across the bridge, if you’d like. Be prepared for cold, windy conditions in the middle — and remember that fog can roll in at any minute. 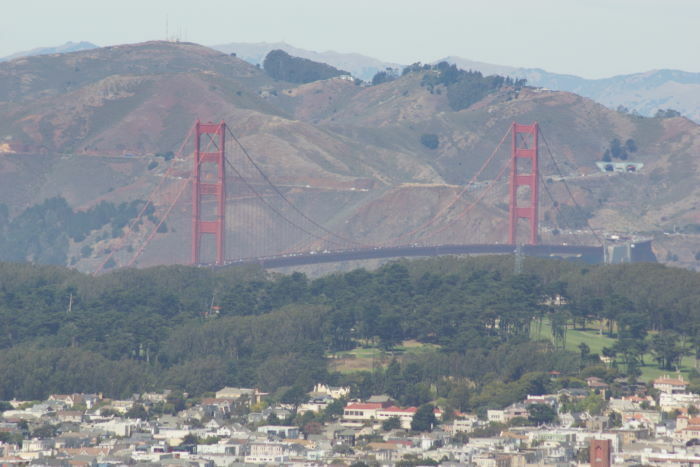 I’d also suggest you check out the semi-secret viewing area on the Marin Headlands, on the north end of the bridge. The views of the Golden Gate Bridge and San Francisco from these viewpoints are jaw-dropping. I’ll tell you exactly how to get there on this page. The Presidio is a giant park at the southern end of the Golden Gate Bridge. These days, it is managed by the National Park Service. Prior to 1994, it served for more than two centuries as a military base. 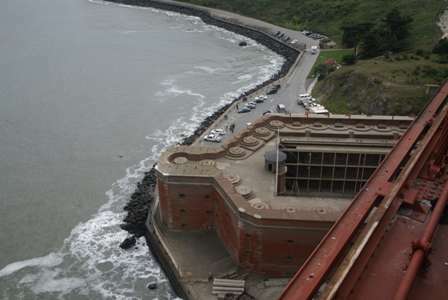 There are numerous remnants of the military days in the park, including Fort Point, directly underneath the Golden Gate Bridge, which dates back to 1861. This is San Francisco’s equivalent to New York’s Central Park, except this west-coast version also has windmills. 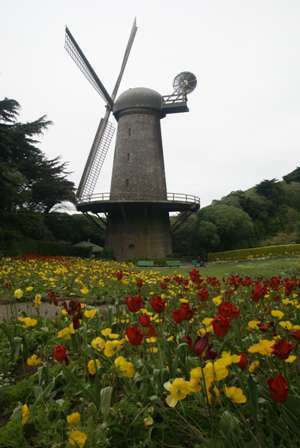 Golden Gate Park is located directly south of the Golden Gate Bridge (via California Highway 1), and it stretches all the way to the Pacific Ocean. More from my 2007 trip. In a city that thrives on weirdness, Haight-Ashbury still manages to stand out. This neighborhood is at the east end of Golden Gate Park. Back in the 60’s, it was ground-zero for hippies. More from my 2007 trip. 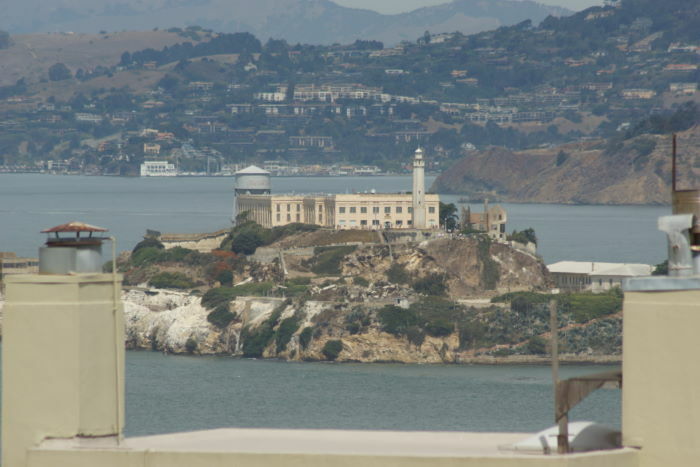 From numerous viewpoints around the city, you’ll be able to look over onto Alcatraz Island. This former prison has captured imaginations for decades. Nowadays, you can catch a ferry over to the island, to check out the prison cells once occupied by murderers. Did you think I forgot them? Of course not! San Francisco just wouldn’t be San Francisco without cable cars grinding their way up and down the steep hills. I spotted this one at the top of Lombard Street, just before the crooked section. 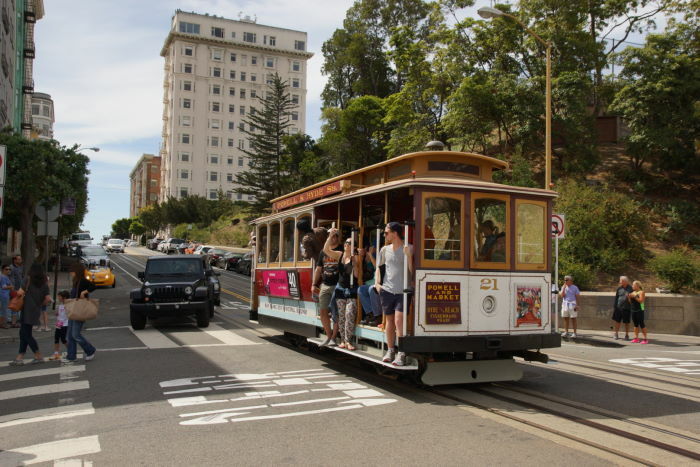 There are three cable car lines that still run in San Francisco. Don’t leave town without taking a ride on one. As of 2016, a one-way ride costs $7. And while that’s somewhat pricey for public transportation, keep in mind that you can make the return trip for a cheaper rate, on a bus, light-rail car, or historic streetcar — all part of San Francisco’s excellent network of public transportation. More from my 2004 trip.